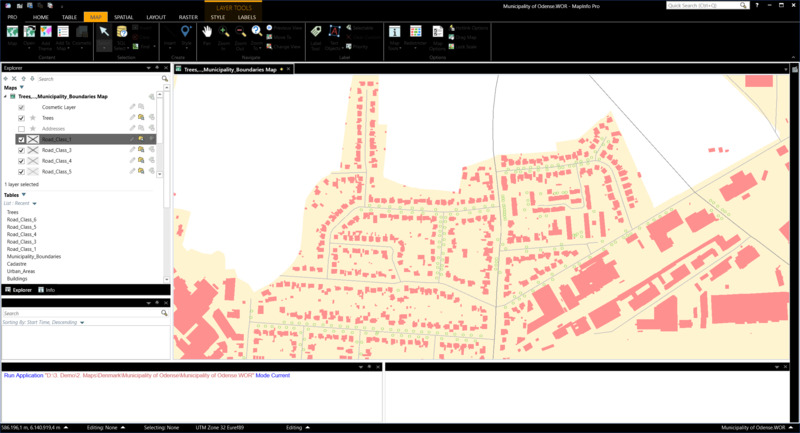 Does anyone know if MapInfo Pro has a dark mode? If not, I think this would be a great addition for future updates. No Dark mode for MIPro, but I'm curious as to how you think one should be implemented for the MapInfoPro UI.? I see this used for programming IDE's that are primarily text, but wondering how it would look with graphical objects, selections in Mappers, Layouts, browsers, etc. Hi Rachel, the UI colours can be altered manually using the relevant xml file, I have recently altered mine to a lighter easy on the eyes style. Is this the type of thing you mean, only with darker colours? I think Peter Moller may have created dark MIP skin last year. I think there are a couple ways it could be implemented. The first could be a full dark mode like google maps has on mobile devices. I provided two images showing a dark mode for maps (Google Maps Night Mode Image or Dark Mode Map Image). The other way it could be implemented would be similar to using Microsoft Office with a dark gray theme (Microsoft Office Dark Mode Image). This way might be more applicable and usable because you could maintain a white background for mapping but have a dark gray background around the edge for the tool bar at the top and explorer on the side, etc. I could see it working really well while working with layouts as well. For me, dark modes are preferable when available because I find it is easier on my eyes throughout the day. Here's my first go at it were i went to the very dark side. This doesn't really work that well with the existing icons and the text on the ribbon. I have attached the MapInfoProStyle.xml which controls the colors used. You can modify these your self if you want to. I do recommend that you create a copy of the original before you start altering it.